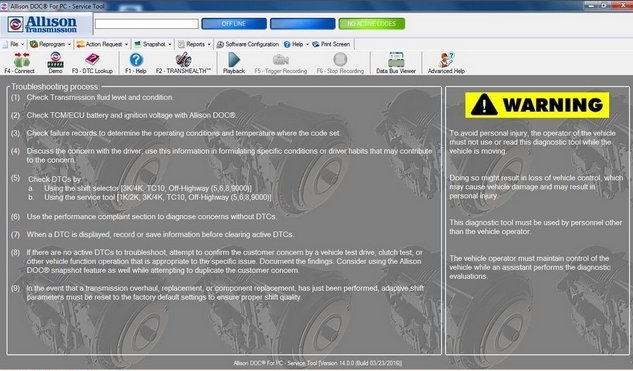 Allison DOC® (Diagnostic Optimized Connection) For PC – Service Tool is a diagnostic system designed for use with Allison’s 3000/4000 Product Families transmissions, 1000/2000 Product Families transmissions, and transmissions using CEC3/CEC2/CEC1 controls. This PC based diagnostic program is capable of communicating with Allison 4th Generation Control System Module TCMs (1000/2000, 3000/4000, and CEC3), WTEC II and WTEC III Electronic Control Units (ECU), 1000/2000 (Allison Pre-4th Generation Controls) TCMs, CEC2, and CEC1 Electronic Control Units (ECU). • Monitors 3000/4000 Product Families Transmission Control Module (TCM) data. • Monitors 1000/2000 Product Families Transmission Control Module (TCM) data. 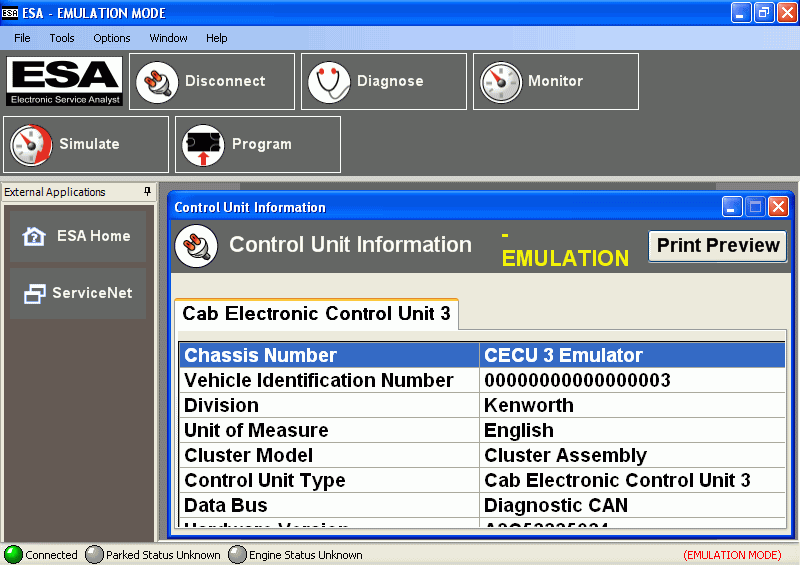 • Monitors CEC/CEC2/CEC3 Electronic Control Unit (ECU) data. • Displays multiple transmission parameters. • Displays a graphical instrument panel with analog and digital gauges. • Displays a graphical strip chart. • Records and plays back diagnostic sessions. • Reprograms selected TCM parameters. • Security measures to control reprogramming TCM/ECU parameters. • Integrated Help with training videos. • DTC information with a direct link to 3000/4000 Troubleshooting Manuals. • DTC information with a direct link to the 1000/2000 Troubleshooting Manuals. • DTC information with a direct link to CEC 2 Troubleshooting Manuals. • A demo mode using prerecorded data. • SmartConnect for detecting the PC-to-vehicle translation device and communication link. • Compliant with applicable TMC Recommended Practices, SAE and CE Standards. • Reprogramming and engineering TAC data enabled. • Communication troubleshooting wizard for those cases where the tool is unable to connect to a control module. 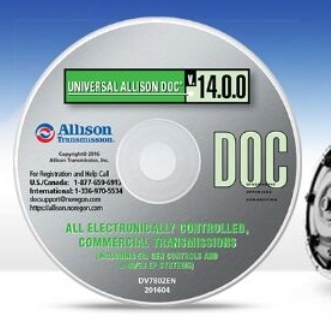 Allison DOC® (Diagnostic Optimized Connection) For PC H 40/50 EP, is a diagnostic program designed for use with Allison‘s H 40/50 EP. This PC based diagnostic program is capable of reading from H 40/50 EP controllers using J1939 communication protocols. • Monitors data from the hybrid PCM, Engine, DPIM, and Energy Storage System. • Reprograms selected PCM settings. • Exports recorded battery voltages to a comma separated file. • Exports user-selected data items to a comma separated file.